Worship is a more general term and an all-embracing life, while prayer is an activity of worship. Worship is more like the exchange of man’s life for the life of God, which takes place in the Divine Liturgy, for example. 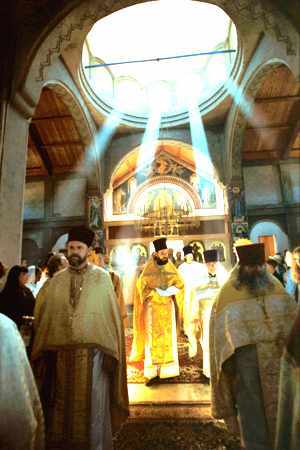 The Divine Liturgy is worship; there is prayer and a whole life there, the life of Christ. In the Holy Eucharist, we accomplish the exchange of our limited and temporal life for the unlimited and infinite life of God. We offer to God a piece of bread and a little wine, but in that bread and wine, we place all our faith, love, humility, expectation of Him, all our life. And we say to God, ‘Thine own of thine own, we offer unto Thee in all and for all.’ We offer to God all our life, having prepared ourselves to come and stand before Him and do this act. And God does the same: He accepts man’s offering and He puts His life – the Holy Spirit – in the gifts, transmaking them into His Body and Blood, in which all the fullness of Divinity is present, and He says to man, ‘The Holy things unto the holy.’ God accepts our gifts and fills them with His life, and He renders them back to us. Consequently, we could say that worship is a more complete thing. In prayer also, we make that exchange, but it is more unilateral. As I read Fr. Zacharias’ words, I thought of the many times I’ve been asked about the difference between “veneration” and “worship.” Since prayer is generally the only part of worship known to many Christians, they are understandably thrown off balance when they enter an Orthodox Church and see people bowing and crossing themselves before the icons, kissing them, etc. And they hear us make prayers to saints as well as God and they immediately hear echoes of the Ten Commandments (“thou shalt not make unto thyself any graven image,” etc.). I have found over the years that one of the problems in explaining the difference between veneration and worship, is that many people know very little about worship itself. The honor given an icon is nothing like the exchange in the Eucharist. The saints do not feed us with their life – they, like us, only have life as they share in the life of God. They have nothing to give us but God. Fr. Zacharias’ words, taken from his book, The Hidden Man of the Heart, are like all his words – profound, but clear. Tomorrow I celebrate liturgy in Dallas along with other priests from across the diocese and the country. In the service, Archimandrite Jonah Paffhausen will be consecrated as Bishop of Fort Worth, and Auxiliary to Archbishop Dmitri of Dallas and the South. In fact, they will be ordaining a deacon and a priest as well. Even by Orthodox standards, it promises to be a long morning – but full of glory. This entry was posted on October 31, 2008 at 9:27 pm and is filed under Orthodox Christianity. You can follow any responses to this entry through the RSS 2.0 feed. You can leave a response, or trackback from your own site. May the Lord seal their ordination! yes. This is something misunderstood between protestants and Orthodox churches because of a lack of terminology to bridge the gap between the two. I have in the past tried to create language to bridge the two, but I feel that it either takes something away from Orthodox understanding when I explain it to my protestant brothers or that my protestant brothers believe they have to stretch to much to understand it from an Orthodox point of view. It is difficult because terminology and theology often are hard to get away from. Speaking as someone who has only witnessed the liturgy twice in my life, not participated. The veneration was the most startling part I think. As I ponder it I think the current western culture is a lot of it. We honor nothing. We do not honor any office or any person. I suspect that makes it a lot harder for us to understand the concept than those of ages past. May the Lord have mercy on Archimandrite Jonah as he begins this new calling of his. Having completed the service this morning, I can say that Bishop Jonah has made a fine start. It has been a very memorable day. Tomorrow I will serve in the liturgy where Bishop Jonah will serve as chief celebrant as Bishop for his first time. I look forward. Today we tonsured a reader, ordained a sub-deacon, ordained a deacon, ordained a priest and consecrated a Bishop. Very long liturgy – but beautiful in the extreme. To be gathered with the Church for such an occasion is a great joy. I fly home tomorrow afternoon. May God keep us all. I was there last night and this morning, in the choir. It was indeed a long but glorious day! I’m sorry that once again, I did not get to meet you, Father Stephen. I thank God for His mercy in bringing Bishop Jonah to us. I believe our Diocese will have a wonderful shepherd for many years to come. having grown up Baptist, I understand your difficulty. That is why you hear so often from Orthodox people, to “come and see”. Our faith can not be expressed in words until one has been able to “steep” in it for awhile. That sounds great, Fr. Stephen.